Provide comfort for the family of Odell Hester with a meaningful gesture of sympathy. Odell Hester was born on September 18, 1928 to Willie and Seloma Hester in Whiteville North Carolina. He was a spiritual man attended the valley church as a young man. He moved to Boston in 1960. He joined the Navy and served 20 years active duty and 10 years reserve. He was the first person to touch the first man sent to outer space “Allen B Shepard” 1961. He was a free mason 32 Carver Den John G Jones #8 Lodge. He was a business owner of several businesses Trucking/Excavations and auto and diesel mechanic, cabs, radio stations and corner stores. He was proceeded in death by his brother Major Ford and wife Janie Ford of Pennsylvania and sister Kathleen Hanley of New York and 3 sons Steven Odell Hester, Ervin Gillard and Nathaniel Gillard all of Boston Mass. 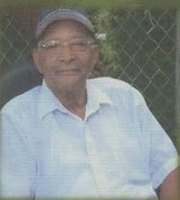 Odell leaves to treasure his precious memories of his life, his sons Little Willie Hester, Jimmy L. Hester, O.D.L. Hester all of Boston, MA, and a host of grandchildren Charmayne Paulding, Shawn Paulding, Eddie Barbosa, Rochelle Gillard, Gregory Gillard, Gerald Gillard all of Boston, MA, Shanay Hester of Lynn, MA, Anthony, Giovanni, Kathleen, Naviya, Ma’shayla, Kieyore, Raqual, Jayden, Cameron all of Boston, MA and a host of other family and friends. To send flowers in memory of Odell Hester, please visit our Heartfelt Sympathies Store. We encourage you to share your most beloved memories of Odell here, so that the family and other loved ones can always see it. You can upload cherished photographs, or share your favorite stories, and can even comment on those shared by others. Provide comfort for the family of Odell Hester by sending flowers.